Below is a simple timeline of events in Stuart Britain, from the accession of James VI to the throne of England as James I, to the death of Queen Anne. Scottish King James VI, son of Mary, Queen of Scots, becomes James I of England and the first King of Great Britain. James makes peace with Spain. 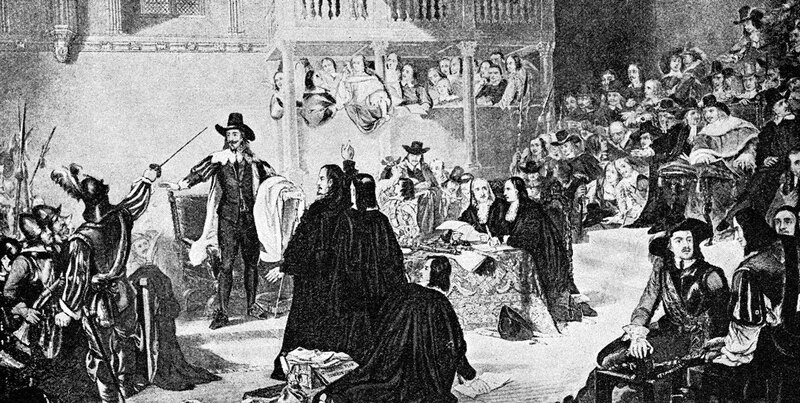 The Gunpowder Plot – a foiled terrorist coup d’etat by a group of Roman Catholics to blow up Parliament, murder the king, and replace him with his daughter, Elizabeth. Foundation of Jamestown, Virginia - the first permanent British colony in North America. The Plantation of Ulster - English and Scottish Protestants are encouraged to move to Ireland taking land confiscated from Catholics. The Newfoundland Company sets out to form a colony in Newfoundland. The King James Bible is published. Sir Walter Raleigh is executed. The Pilgrim Fathers sail to the New World. Oxford’s Botanic Garden founded - Britain's oldest botanic garden. Barbados becomes a British colony. George Villiers, Duke of Buckingham, Charles I's unpopular chief minister, is assassinated in Portsmouth. William Harvey describes the circulation of blood in the human body. Charles I dissolves Parliament and rules without it for 11 years. 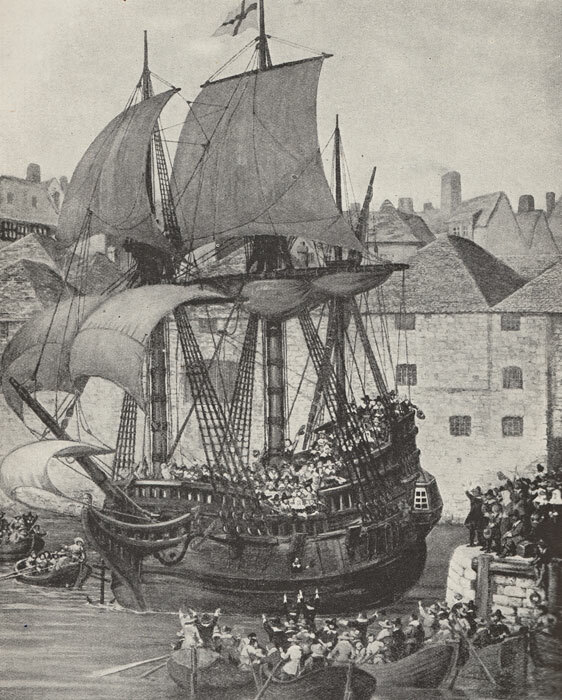 Marked emigration to Massachusetts Bay, particularly of fundamental Puritan Protestants. Charles I tries to force a new prayer book in Scotland, which is seen as an attempt to reintroduce Catholicism. The first coffee house in Britain opens, in Oxford. Scots draw up a National Covenant to resist 'religious innovation', and demand a free Scottish parliament. Start of the Long Parliament. The start of the English Civil War between Parliament and the King. Charles I raises his standard at Nottingham. Alliance between the English and Scottish parliaments against the King. Parliament wins the Battle of Marston Moor. The King loses control of the North of England. Parliament's New Model Army wins the Battle of Naseby; the Royalist army is effectively destroyed. Charles I surrenders to the Scots. The Scots sell Charles to Parliament. 2nd Civil War. Oliver Cromwell beats a Royalist army at Preston. The trial and execution of Charles I. England and Wales become a republic. Oliver Cromwell crushes resistance in Ireland, including the controversial sackings of Drogheda and Wexford. Cromwell crushes resistance in Scotland. Charles II is crowned King in Scotland - and defeated at the Battle of Worcester. Society of Friends (Quakers) is founded. Jews are allowed to return to England. Britain takes Jamaica from Spain. Cromwell dies. The first tea is sold in Britain. Restoration of the Monarchy. The Royal Society is founded. And it's the year that Samuel Pepys started a diary. The British capture New Amsterdam and rename it New York (after the Duke of York, the future James II). 2nd Dutch War. In 1667, the Dutch attack the Naval Dockyard at Chatham. The Great Plague of (mainly) London. Robert Hooke discovers the cell. Great Fire of London – destroys most of the medieval city. John Milton publishes Paradise Lost. Christopher Wren is given the job of designing a new St Paul's Cathedral. The Test Act excludes Catholics from public office. Titus Oats and the Popish Plot – a fictitious plan to assassinate the king. John Bunyan publishes Pilgrim's Progress. The Act of Habeas Corpus guards against unlawful imprisonment. The Ashmolean Museum opens in Oxford - Britain's oldest museum. The Monmouth Rebellion – ends in failure. Isaac Newton publishes his theory of universal gravitation and three laws of motion. The Glorious Revolution - William of Orange is 'invited' to invade, lands a Dutch Army in Brixham and James II flees the country. The Bill of Rights establishes the principles of a constitutional monarchy. Battle of the Boyne. Ousted King James and his Catholics are beaten by opportunist King William and his Protestants. The massacre at Glen Coe. Foundation of the Bank of England. Foundation of the Bank of Scotland. The English Parliament opens the slave trade to all. The Scottish Darien Company attempts to establish the colony of Caledonia in Panama; its subsequent failure was a serious blow for Scotland. War of the Spanish Succession. Act of Settlement - determines that the next monarch will be a Protestant. Battle of Blenheim. Allied armies under the Duke of Marlborough decisively beat a combined French/Bavarian army. Act of Union between England and Scotland. Abraham Darby launches a new process to make cheaper iron products using coke. Death of Queen Anne, the last Stuart monarch. She is succeeded by George, Elector of Hanover, who became George I.